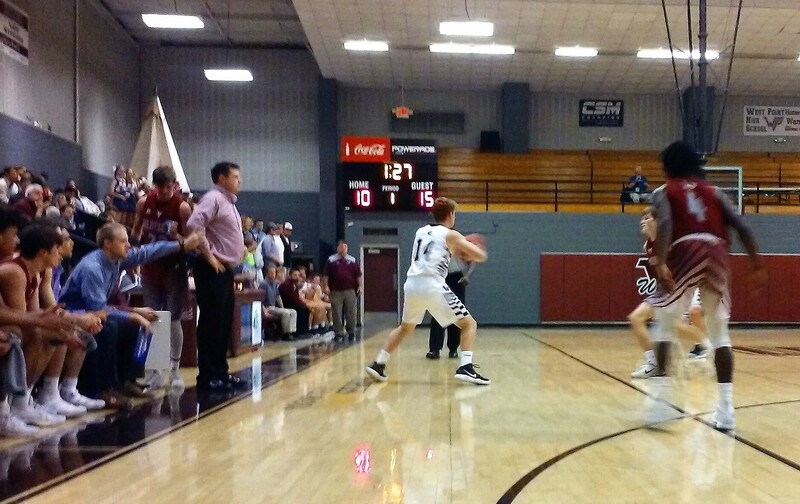 WEST POINT – West Point took on Hartselle in two huge varsity match-ups Monday evening. In the end, the Warriors and Lady Warriors were the victims of a sweep. Fans on both sides were treated to a great game between two excellent girls’ teams, and No. 7 West Point looked to stay undefeated against the Lady Tigers. It started out sloppy for both teams. Hartselle's Madison Lawler scored the first basket of the game for either team, and West Point's Micah Oldacre answered with a trey. It was a struggle for both teams to score, and each team traded threes to end their droughts. After Moriah Taylor nailed her second three of the quarter to give the Lady Tigers an 8-6 lead, Micah Oldacre answered with a layup, and later, Lexi Shadix nailed a three from the left wing to give the Lady Warriors an 11-8 lead. Masyn Marchbanks tied the game with a trey of her own, and the score was tied at 11-all after one. Hartselle started out the second period strong, as a layup, followed by back-to-back threes by Allie Mayfield, started an 8-2 run for the Lady Tigers, who took a 19-13 lead with 6:29 remaining in the first half, forcing a West Point timeout. They would stretch it to 26-15 after an Anna Mathis trey. But Shadix started to bring her team back into the game, as she went on a 10-0 run by herself, including going 6-for-6 from the line, to help cut the deficit to just five at 30-25. But Taylor killed the rally with a three from the top of the key just before the buzzer sounded to make it a 33-25 game at the half. The Lady Warriors cut it to two to start the third after two Mackenzie Carter layups and one by Miriam Oldacre, and they kept the Lady Tigers’ offense in check for most of the quarter. West Point started to make a run toward the end of the quarter, as, off of a Hartselle turnover, Shadix laid it up and in and Micah Oldacre nailed a trey with 44 seconds left to give the Lady Warriors a 43-41 lead, but Taylor and Mathis scored the final three points to give Hartselle a 44-43 lead going into the final eight minutes. Both defenses showed up to play in the final quarter. Taylor hit a layup to increase the Lady Tiger lead to 46-43. Carter hit a layup and went 1-of-2 from the charity stripe. Miriam Oldacre missed her free throw attempt, but the Lady Warriors got a second chance as they grabbed the offensive board, and Carter split from the line, giving them a 47-46 lead. Off the second free throw miss, West Point got another rebound and Shadix hit a layup to make it 49-46 West Point. After Marchbanks hit a big deep ball and split from the charity stripe to give the Lady Tigers a 52-49 lead, Olivia Ball drilled a huge three from the right wing to tie it up at 52 with 27 seconds remaining, and West Point's crowd was going insane. With nine seconds remaining in the game, Mathis found a big hole down low, and she laid it in before the buzzer sounded, handing the Lady Warriors their first loss of the season. West Point (10-1) was led by Shadix with 19 points, 11 rebounds and a pair of steals. Micah Oldacre ended up with eight points and two steals. Carter finished with eight points, two steals and two blocks. Miriam Oldacre finished with six points, seven rebounds and three steals. Ball also had six points and six rebounds; Brooke Brownfield ended up with three points and two steals. The Lady Warriors finished 11-of-19 from the charity stripe, with crucial misses coming in the final period. West Point got off to a quick start, jumping out to a 5-0 lead behind a three by Coby Sullins and a layup by Austin Dubberly. But freshman Brody Peebles went off in the opening quarter, putting up 15 of Hartselle's 19 points, to turn what was a 10-6 Warrior lead into a 19-12 lead for the Tigers after one. Peebles wound up finishing with 29 points for the game. The second period quickly turned into a nightmare for West Point, as Hartselle couldn't seem to miss, going on a 17-0 run, to turn a close game into a 36-12 rout before Kolton Sapp finally hit a free throw to give the Warriors their first point of the quarter, and at the 1:43 mark, Sullins nailed a three to give them their first basket of the quarter, but they ended up being outscored, 30-9, as they went into the locker room down, 49-21, and they never could make up the deficit despite their best efforts. Dubberly and Sapp led West Point with eight points. Sullins ended up with six. Rylan Jones finished with five, as did Tyler Thompson and Hunter Persall. Dalton White had four. The Warriors saw their four-game winning streak come up to an end. They fall to 5-5 on the season, and will travel to Cullman on Tuesday.